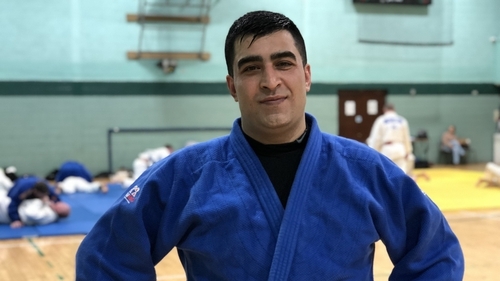 An Iranian refugee who has represented Ireland at judo is looking forward to living under the same roof as his wife and daughter for the first time in ten years. Morteza Najafi fled Iran in 2008 due to fear of persecution. He spent six years in the asylum system in Ireland before gaining refugee status. Over the past four years he has been trying to secure the right for his family to join him here. "The past ten years have been very tough. I have had to watch my daughter grow up over Skype," he said. Mr Najafi's wife and daughter finally arrived in Ireland last month, under the Family Reunification programme. The Najafi family is about to move into a house in Leixlip, Co Kildare, organised through a pilot housing project run by the Irish Refugee Council. The project involves the IRC being leased properties from Irish religious congregations, other bodies, civil society and members of the public. The properties are then sub-leased to individuals and families who are trying to exit Direct Provision or who have entered the country under Family Reunification. The IRC acts as the 'landlord' and provides, in conjunction with local service providers, care and assistance to tenants under its 'holistic integration' approach. The IRC says more than 50 people have been housed in 12 properties since the end of 2016. Mr Najafi has been decorating the house his family will move into at the beginning of next month. "That will be a fantastic day for us. I am so grateful for all the help we have received from the Irish Refugee Council. After ten long years apart, we will finally be able to live together again in our own home," he said.